In the twenty-first century, there are many ways to write. You can use a pen and paper, a typewriter, computer or even a tablet. I don't think any one of these is better than the other because the end result is the same. There is also the fact that some of these options are more portable than the other. Pens don't rely on battery power. Many typewriters also don't require a power supply, but they're not the easiest thing to lug from one place to another. Tablets can be small enough to slip into your bag, but big enough to not need an additional keyboard and the same can apply to some laptops. The best way for you to write can be a mix of these, or perhaps just one or two. THE PROS & CONS OF PEN AND PAPER. The obvious pro is one I have already mentioned and that's the fact that they don't require any power supply. The worst that can happen is that you run out of ink or paper to write on, and they are so cheap and easily available that it's not hard to replace them when you need more. The majority of people have the necessary skills to use a pen, but there are some drawbacks. I have Fibromyalgia and because of the way it affects my hands, I can't grip a pen for longer than about thirty seconds, which makes writing by hand either a really long process at best, to nigh on impossible. There's also the problem that it can be difficult to write down things fast enough to keep up with the thoughts in your head. This is a drawback for all methods of writing, but the pen comes with the additional problem that if you can write and keep up, then your handwriting may not be the easiest to read and if you can't read what you wrote, then you can't type it up. That's another disadvantage of the pen: the majority of publishers require work to be typewritten. If you're an indie author, you will need to be able to upload your work into cyberspace and that means it needs to be transferred to your computer at some point. However, despite these cons, there is something that I do miss about handwriting my chapters and that's the simplicity of it all. When I first started writing, I would hand write a chapter a day. Those were the days before the Fibro had caused my hand issues and I would then type it up in the evening and edit as I went. I did that up until I started writing my seventh book, at which point the pain from writing was so bad that I was starting to avoid writing and that wasn't a path I wanted to go down. THE PROS & CONS OF TYPING ON A TYPEWRITER OR COMPUTER. I've put these two together because they have similar results: you end up with neatly typed work and it allows you to send your manuscript off to a publisher without the added hassle of having to decipher and type up what you've already written. Typewriters and laptops are somewhat portable and while the typewriter doesn't generally need power, the laptop does and although batteries are improving all the time, you don't want to be sat in Starbucks writing and the battery die and end up losing all the work you've done. But in the age of email, typewritten work is less likely to be accepted and you're once again faced with the issue of somehow having to put everything on the computer so that you can send it to an editor. There are some editors who will be happy to accept the hard copy, but many others prefer to work on a computer. There is also the issue of typewriter parts, which are getting harder and harder to find and can get quite expensive. So if you do manage to get a lot written, and the ribbon runs out, then you're stuck. There is also the issue of mistakes. It's harder to correct these on a typewriter while keeping the work neat enough to be read by or submitted to someone else. Computers don't have that issue, you can edit as you go, change words, or even delete a whole section without it having an effect on the presentation. But they can crash at the worst possible moments and lose the work you've slaved over. There are also the issues of computer viruses and the worry of being hacked, all of which don't apply to a typewriter. THE PROS & CONS OF USING A TABLET. Tablets are very portable and there's an ever increasing range of word processing apps out there. There's also a large variety of cloud storage apps available, which allow you to transfer files easily between people or computers. I use the Dropbox app for a number of things, such as getting edits from my editor and swapping graphic files with my artist. However, you once again have the issue of battery life. Many cheap tablets have a crap battery life, but it's not in everyone's budget to pay a lot of money for something that's still often thought of as a luxury extra. There is another drawback that some tablets don't have a large enough screen to be able to type very well with the onscreen keyboard. They are easy to make mistakes on, but again that is easily fixed without affecting the presentation of the final piece. I have a 10.1 inch tablet and I find it very easy to type with both hands on the keyboard. There is always the option of buying a separate keyboard that will connect to the tablet with minimal effect on the portability of the tablet. I have not tried to edit a whole book on a tablet, but my editor uses her iPad to do the actual editing and she seems to find that easy enough, albeit a little slow. 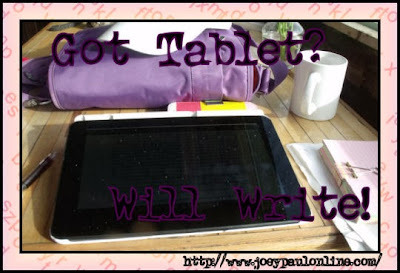 The ease of transfer and email mean it's pretty easy to use the tablet as your main writing tool without the need for another computer - be that laptop or desktop. I personally prefer to have both, but if in the future I am without a computer and the means to get one, I would feel comfortable just relying on my tablet. The only downside I can see to that is that a tablet does not yet have the processing power to do video and graphical editing. However, technology is moving faster and faster and it wouldn't surprise me if tablets become the norm for the majority of writers in the near future. So however you choose to actually write, there are a number or pros and cons for each method. It really is just about finding what works best for you and many writers will use a combination of all three, whilst others find one that works for them and sticks with it. In the age of email, apps and e-books, it is becoming more common for people to use a computer or tablet to do the majority of their work.